Crystal Acoustics saves energy with smart sockets | What Hi-Fi? The more expensive unit will only shut down when all the connected devices are in standby. Also available is the more basic CES-5F, which is a power strip having one 'always on' socket and four controlled by a footswitch. 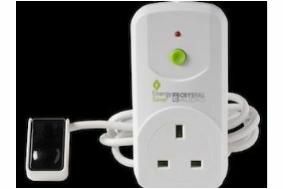 Crystal suggests this £14.90 unit is ideal for use at desks - when you leave the desk you simply step on the switch to power down peripherals such as printers and chargers, while keeping your computer powered up.